Bill Boushka: Details on Sandy's aftermath will increase debate on effectiveness of volunteerism, preparedness, "personal responsibility"
Details on Sandy's aftermath will increase debate on effectiveness of volunteerism, preparedness, "personal responsibility"
On Saturday, December 22, 2012, the New York Times ran a detailed story by David M. Halbfinger, Charlges V. Bagli and Sarah Maslin Nir, about the “truth” about Sandy devastation and the real needs of residents and property owners. It’s On Ravaged Coastline, It’s Rebuild Deliberately v. Rebuild Now”, link here. The article has detailed maps of the New Jersey, New York City , Long Island and southern New England coastlines, as to the extent of damage. Generally, most damage in New Jersey was within a mile of coastal water. Much of it was on the coastal isthmuses. But some was along bays and rivers going inland, and the largest was in an inland but low lying area near the meadowlands, Hoboken. Except for Hoboken, much of the property belonged to higher income residents and tended to be insured. New York City and near Long Island are another matter. The inventory of low-lying areas of Staten Island and Brooklyn are not complete, and losses were extensive, as we know, in the Rockaways, other areas of southerm Queens, and Long Beach. The resort area of Fire Island was heavily damaged. Except for Fire Island, many of the homeowners were “blue collar” and working class. The windspeeds where the eye moved onshore were “only” about 80 mph, and most of the severe damage occurred more than 40 miles away, from storm surge combined with tide, not from wind. This kinds of damage could have happened from a cold-core “Noreaster” in the “wrong place” at high tide. It’s not as clear that it really couldn’t happen without climate change. Nevertheless, lower and medium income residents in the New York areas said they had never experienced anything like this in decades, but had always “tolerated” smaller flooding. So where does this leave the issue of volunteerism and shared goals vs. “personal responsibility” as discussed here Nov. 17? It’s mixed. In most of the New Jersey areas, this is sounding like a problem locals should solve themselves with engineering (which could need federal help) and careful building codes. New York is a different matter. As widely reported, the worst hit areas depended on volunteers, some of them from Wall Street firms, and government and institutional response was slow and badly insufficient for a long time. This involved people with fewer resources and less opportunity to anticipate a disaster like this on their own, and a public infrastructure not ready to handle it. If I had been living in Manhattan at the time in the Village, I might have been without power for a number of days myself. It strikes me that a disaster like this makes us ponder how we should handle the policy debate over the “fiscall cliff”. The basic, centrist answer is that the safest thing is to do a little of everything (tax hikes, care outs, gradual benefit slowdown, increased eligibility ages, and “doing the math”). That means you can’t protect any one person or group from some sacrifice and some harm. You can try to prevent smaller groups or individuals from big harm or catastrophe, which really can happen if Congress is so paralyzed that it can’t do anything. But that is what some “deconstructionists” want: a world where people have to take care of one another, as the government and public infrastructure withers away. It’s a scary thought. 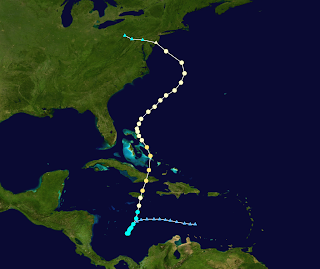 Wikiepdia attribution link for track of Sandy.